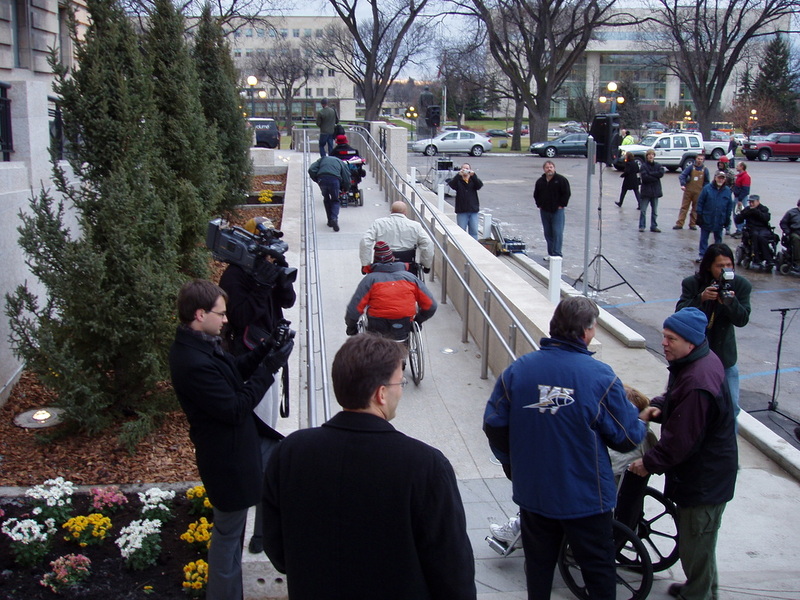 The Manitoba Legislative Building was the first legislative building in Canada to provide full access at its front doors with the completion of a universal access ramp at the front entrance. (Read the 2007 press release.) Every person is entitled to full and equal access to the Manitoba Legislature. This project ensured that this right is now a reality. Two descending ramps on the east and west sides of the building were created in the 1970s, prior to best practices for access, and had posed several problems. Providing universal access (visual and physical) for all those visiting the Manitoba Legislative Building -- through the intended doors of entry -- required design sensitivity to this National Heritage Site. The award-winning Path to Full Citizenship reveres the heritage elements of the building. The robust limestone ramp addition was designed to express the timeless qualities of the Legislative Building. To ensure complete reversibility, however, a cantilever was created to support the entire weight of the ramp. The limestone for the ramp was sourced from the same quarry as the original building.